Each week, Will Shortz, NPR's puzzle master and The New York Times' crossword puzzle editor, presents an on-air quiz to one contestant and gives a challenge for listeners at home. December 30, 2018  NPR's Leila Fadel plays the puzzle with puzzle master Will Shortz and Lance Wynn from Stansbury Park, Utah. 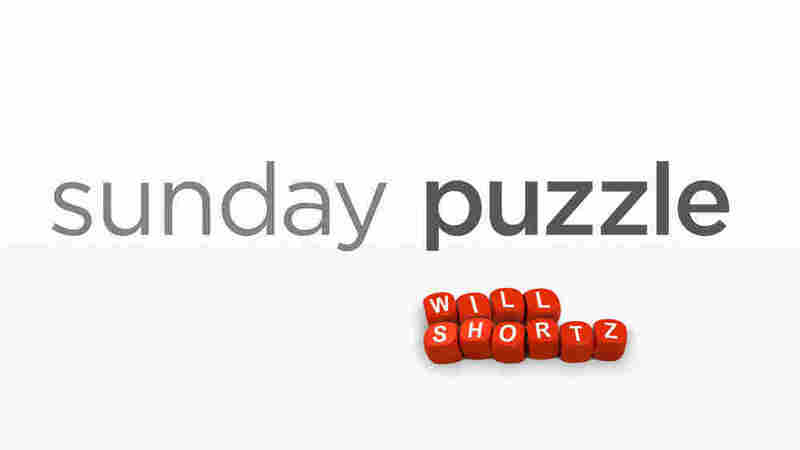 December 23, 2018  Weekend Edition puzzlemaster Will Shortz tries to stump NPR's Lulu Garcia-Navarro and WNYC listener Bernard Dickman of Middletown, N.J.
December 16, 2018  Weekend Edition's Lulu Garcia-Navarro and puzzle master Will Shortz play this week's puzzle with WXXI and WYPR listener Jonathan Sussman of Pittsford, N.Y.
December 9, 2018  Weekend Edition's Lulu Garcia-Navarro and Puzzlemaster Will Shortz play a word game with KPBS listener Geoffrey Mayne of San Diego, Calif.
December 2, 2018  Lulu Garcia-Navarro and Will Shortz play the puzzle with WNYC listener Lucas Green of Brooklyn, N.Y.
November 25, 2018  NPR's Sacha Pfeiffer plays the puzzle with Weekend Edition's puzzlemaster Will Shortz and Marilyn Rogers of Austin. November 18, 2018  Weekend Edition's Lulu Garcia-Navarro and New York Times Puzzlemaster Will Shortz play a word game with WWNO listener Eric Bogren of New Orleans, La. November 11, 2018  NPR's Lulu Garcia-Navarro and Weekend Edition Puzzlemaster Will Shortz play a word game with WNYC listener Eileen Appel of New York City.